A Pianta fishing in Goomba's Booty Boardwalk. 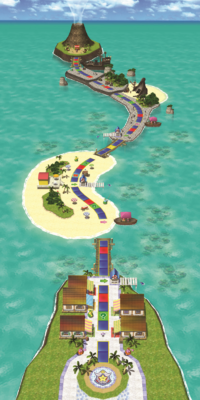 Goomba's Booty Boardwalk is a board from Mario Party 8 that is set on a peninsula and a few islands with many Piantas. 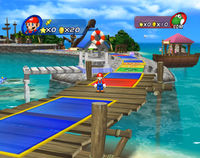 Like Pagoda Peak from Mario Party 7, players travel on a one-way path to end to the end of the board and meet the board's owner, Captain Goomba. Unlike Pagoda Peak, however, when players reach the captain, he will give them a Star from his chest absolutely free, then send the player back to start via gulls. Despite being the longest board in the game, there are many shortcuts. Players can pay Dolphins a random price to ride on their backs (in a manner similar to Koopa's Seaside Soiree in Mario Party 4) to travel a number of spaces closer to Captain Goomba. Also, when a player lands on the Lucky Space, a dolphin will carry them to a secret island, supposedly sacred to Goombas, free of charge. Once there, the player will find two Goomba idols, who will give them a free star in a chest before telling them to leave the island. The player will then go back to the main boardwalk. Landing on ? Spaces with yellow Piantas next to the player will make the Pianta kindly toss them to a farther space. Landing on the ? Space next to fishing blue Piantas causes their rod to catch a piece of Candy. They will give it to the player every time, for they want fish, not candy (but they'll keep it if the player's inventory is full). The ? Space next to the shipwreck makes the player go inside and get coins out of it from a chest. Landing on the ? Space next to Captain Goomba's ship makes the Goomba Pirates stuff the player into their cannon and blast them back to the start. If players land at a DK Space, Donkey Kong will appear. He makes the player deposit 5 coins in a DK Barrel, then lets them shake the barrel using the Wii Remote. The better they do, the more coins they get back; players can get back 11 to 25 coins. But if the player has no coins for Donkey Kong to play with, Donkey Kong gives them 10 coins. When players stop at a Bowser Space, Bowser will come and summon three Lava Bubbles to attack them three times with them losing 10 coins each time (30 coins). Players will have to use the remote again to jump the Lava Bubbles when they attack. If the player has no coins, then Bowser gives the player 10 coins instead. Mario in the Star Battle Arena. In Star Battle Arena, the winning conditions are to get one star and the star is 50 coins. The player has to collect 50 coins and make it to Captain Goomba first (just like Pagoda Peak on Solo Cruise Mode in Mario Party 7; except the winning conditions to get the star from Koopa Master on Pagoda Peak is 100 coins). If a player does not have 50 by the time they make it to the captain, he lets them roll a coin block, then his goons will shoot them back to the start. In this mode, this board is a linear path (with no alternate areas to take), the Candy Shop is closed and the only way to get candy is to pass the Candy Space, and Dolphins only occur if the player lands on one of the Green Spaces which are free of charge. This page was last edited on December 19, 2018, at 18:38.